Day 10 of the #JusticeforLB Advent Calendar is another cause for celebration in the Justice Shed. We are pleased to announce that we have now received over 1,000 pledges of support for the #LBBill. The first draft of the Bill was shared just over a month ago, and we are thrilled with the response that it has received. There has been much discussion on social media channels, by email and face to face, including an open meeting in Manchester organised by Eve Holt and PSG Speak Up. There are more opportunities coming up for people to gather and discuss the Bill, and we welcome all your thoughts. The current total of pledges is 1,020. That consists of 1 Parliamentary Candidate, 42 Organisations and 977 individuals. Recent organisational pledges have come from Ambitious about Autism, Mencap, The National Autistic Society and Zinnia Community Enterprise. 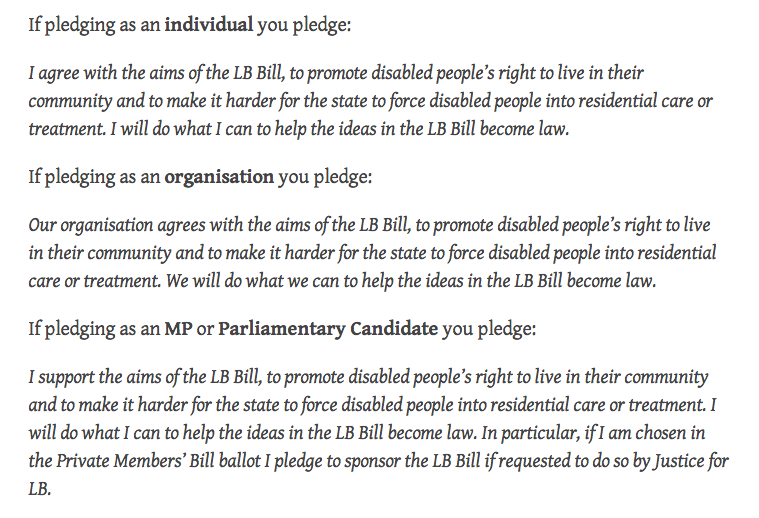 If you support the principles of the #LBBill then please add your support here. Keep your eyes peeled for more on the #LBBill later in the advent season! If you wish to see who has yet to pledge and give them a nudge if they’re missing, check out the list of supporters here.